Orange is such a refreshing color. It's the last color hanging around in late fall. A deep orange is a color we crave in the dead of winter maybe because it's the color of fire. Orange is the color of the best things in life. That dramatic sunset spotted with stormy clouds? It's not complete without a splash of orange. The mischevious little fox, circling a farmer's hen house? His dashing little face is a bright and alert orange. And let's not forget the Halloween favorite, the Jack-o-lantern. 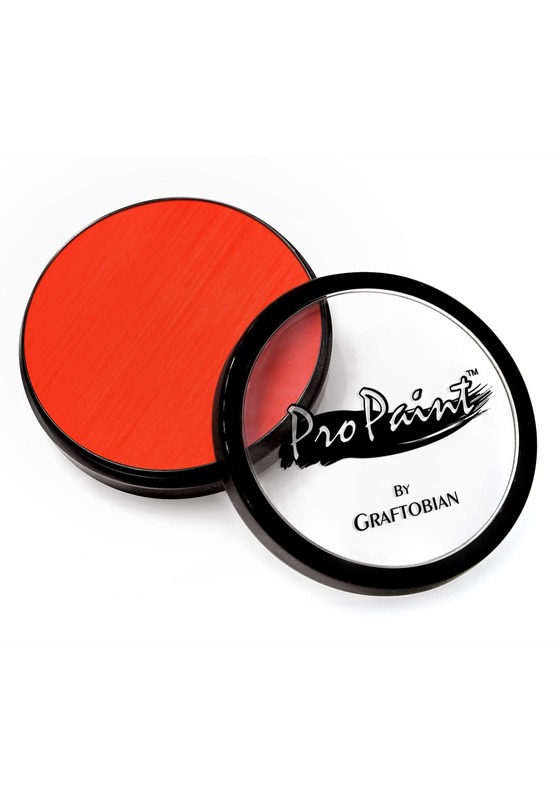 With all this orange love, you've got to have this color in your face paint arsenal! This pro-paint cake is activated with a little water. Apply it with a sponge applicator or with fingers. Once it drys, it's smudge-proof! You can use it on your face, body, or even your hair! And when you're ready to return to your original hue, simply wash it off with warm soap and water. So, whether you're dressing up as a while fox or you want to apply dramatic and fashionable fire dancer makeup, you'll be happy with this deep hue. Just be careful if you go out as a life-size Cheese puff, people might think you look good enough to eat!